Posters are the ancient form of advertising and are still evolving to visually communicate your ideas. Though the posters are in existence from the 1700s, it was widely spread in the mids of 1800s, especially in European regions. In the earlier time, only three colors were used in the poster designing. But in the modern days, we can make colorful posters in no time. The poster mockups in this list will help you present all your colorful lively designs elegantly to the users. Making posters was a time-consuming process in the earlier days. After the invention of three stone lithographic process, mass production can be done easily. In the present computer era, we can make thousands of posters in no time. The poster mockups in this list are designed for the present-day audience, all you have to do is to add your contents. Typographic played a major role in the poster designing. One of the main goals of the poster is even a person at a long distance should be able to clearly read the content. Typographic have evolved a lot from the ancient print technology. With the typography itself, you can clearly express your feelings. These poster mockups will give you enough space for the typography contents as well. Posters are always aimed to reach a mass audience. You can see the posters always placed in public places where people gather a lot. Urban areas are by default has a high population. If your target audience mostly lives in busy urban areas, this mockup will give a perfect idea. As a package, you get 211 poster mockups. If you are an agency or freelancer, you will find this mockup worth for the money you pay. 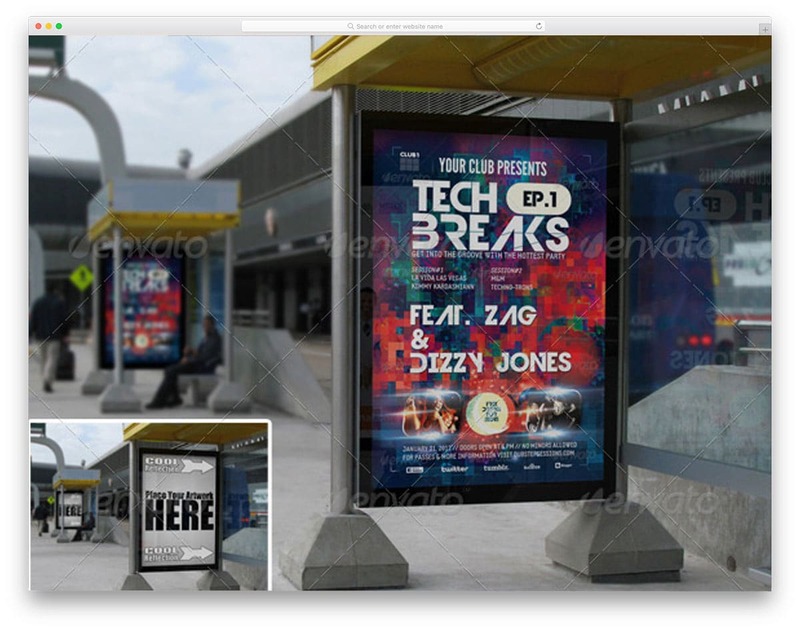 Since it has more than one mockup you can showcase your design in different outdoor scenes. All the PSD layers are perfectly optimized to make your poster design look realistic in an urban area background. High-quality images are used in this mockup so that you can easily scale them to the size you want. Wheatpaste Poster Mockup is a normal A3 size poster mockup you can use to showcase your design. Wrinkled paper and torn edges give a realistic view to this mockup. Print technology has improved a lot from the lithographic method used before. You can make colorful posters in no time with today’s printers. Typography has played a major role in the poster design. Many artists in the earlier poster designing days used bold stylish fonts to get user attention. But now, we have many lively fonts. Even with a minimal design, we can get busy pedestrians attention. To give you a more realistic background, the creator of this mockup has updated it with new background patterns and images. If you are mainly creating posters with trendy typography design, then this is the mockup for you. 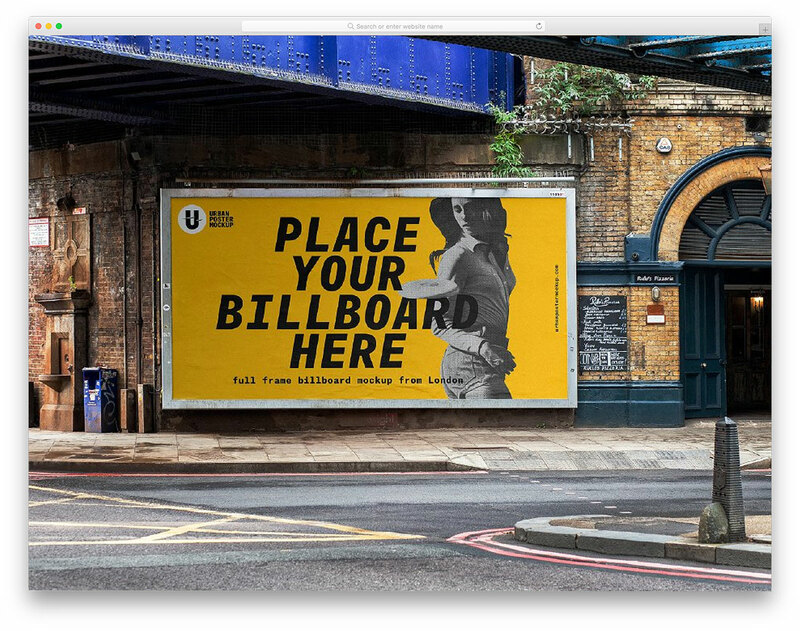 Billboard Poster Mockup is actually one of the mockup sets in the Urban Poster mockup bundle mentioned above. For some reason, if you really don’t want to pay that much money for the entire set. You can go for this affordable option. Of course, it has only this mockup in this set for the reduced pricing. The designer of this mockup has taken London streets in this image. So if you are particularly looking for this location, this is the mockup for you. The layers of the poster mockup are preserved so well to give a photorealistic image. Textures on the billboard make the poster look surreal. If you want to create a scene with your poster, this mockup will come in handy. Flyer & Poster Bundle is another designer-friendly cost saving mockup bundle. The creator of this mockup has given you six formats. All the six formats are most commonly use one so you can use it for all purpose. With the bundle itself, you get some pre-made designs. If you are looking for images and elements for your website design, this mockup will help you. As the images used in this mockup are high-quality images, you can easily scale them and optimize it for your needs. Another advantage with this mockup set is it is available in the Illustrator version as well. Poster frame mockups are also given in this mockup to elegantly present your poster design. If you are looking for some cool looking poster frame mockups for your presentation; keep reading the post, we have mentioned a few below. This particular mockup is designed specifically for design studios. The designer of this mockup has used several minimalistic elements to present your poster design elegantly to the users. Rather than simply sending your design, using mockups like this will give a life to your design. Different types of frames, boxes, and stands are used in this mockup. Based on your design, needs you can choose one. All the scenes in this mockup have minimalistic look so you needn’t worry about over dominating elements in this mockup. In the download file, you get 30 PSD files and help documents. 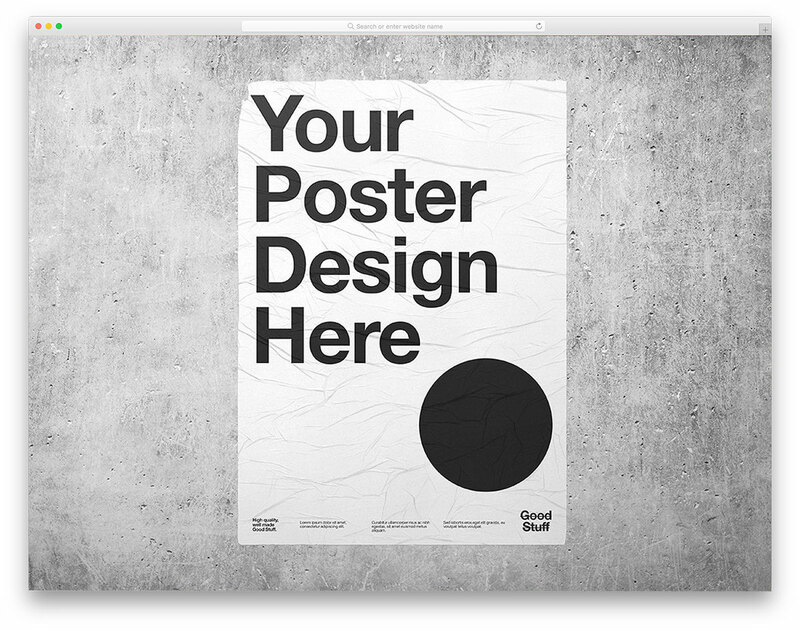 You can easily adjust this mockup for any poster size as you want. For optimal results, the creator of this mockup recommends Photoshop version CS4 and above. From the name itself you can clearly understand this mockup is from the creators of the Urban Poster Mockup Bundle mentioned above. 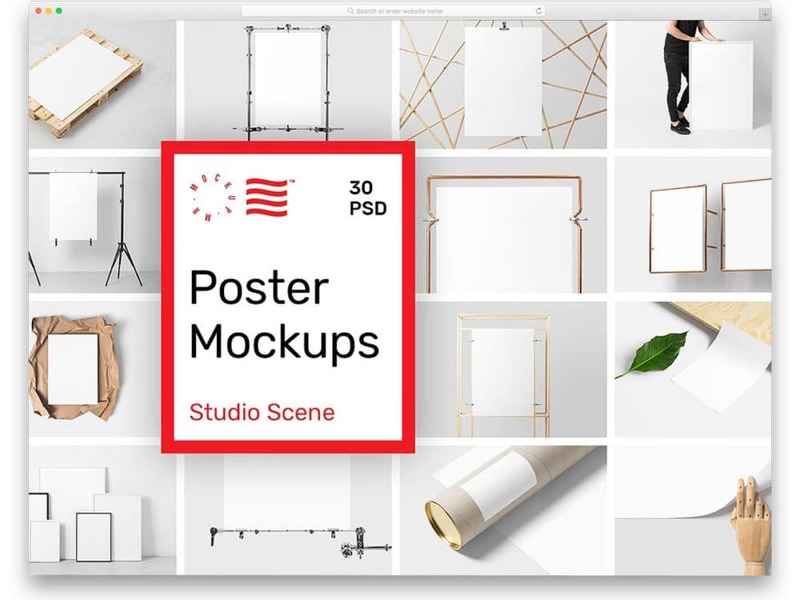 In this mockup set, you have a few mockup collections for a reduced price. 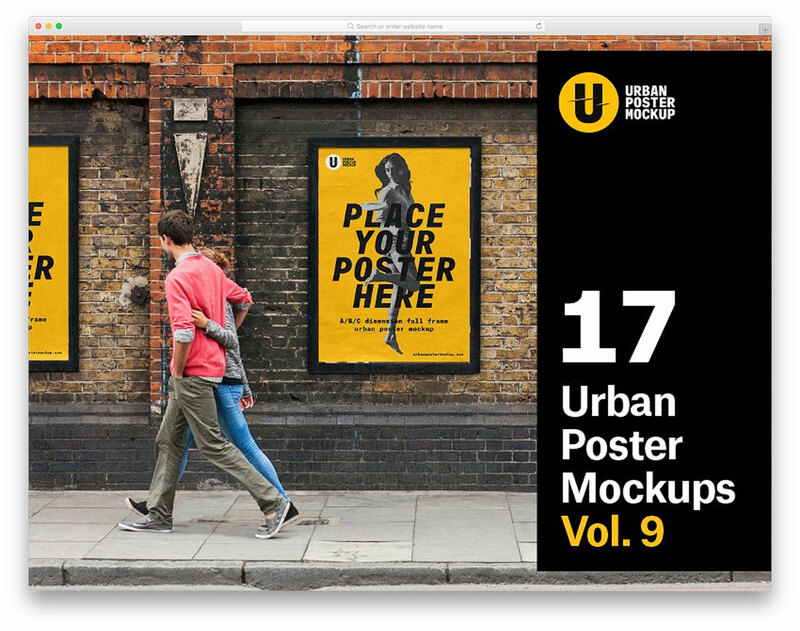 With this mockup set, you get 17 urban design poster mockups. 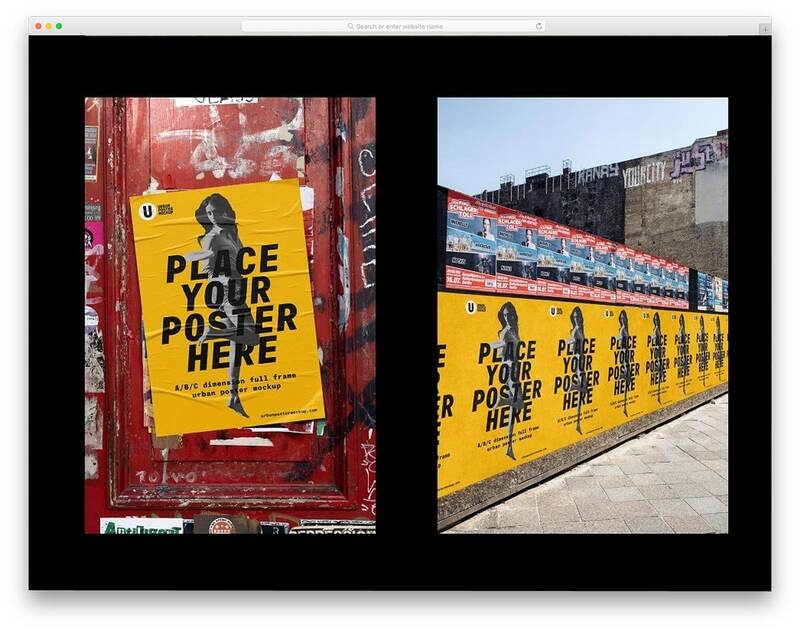 All the images in this mockup are taken in the streets of London. So you get a realistic view and some of them even have human elements to give a realistic street view. If you are making posters for products, showing them in mockups like this will give a clear idea to your clients. The layers of the mockup are handled smartly so that you get a realistic view and lighting on your design. If you are a freelancer or solorpreneur, this mockup will save a lot of your time. If you are looking for some cool looking frames for your poster presentations, this one might impress you. The designer of this mockups has given you many minimal looking frames with other elements. Most of the scene used in this mockup is minimal looking so your design will be neatly highlighted. Shadows and the reflections in the mockups are preserved carefully so that you get a realistic view. All you have to do is to add your poster design and present it elegantly to the users. With this package, you get ten PSD files and all of them properly layered for easier customizations. The designer of this mockup has used beautiful looking interior design elements. If you are making an interior design website or furniture website, you can use this mockup for your web images and elements. The minimal looking interior elements add richness to your design. Especially if you are making artistic poster designs, then this mockup will enhance the beauty of your poster by two times. As most of the image has lots of white space background, even colorful posters will look vibrant in this mockup. The creator of this mockup has included fifteen mockups with this set. All the mockups are Photoshop files with properly layered structure. Busy designers will find this mockup extremely useful and save their time. 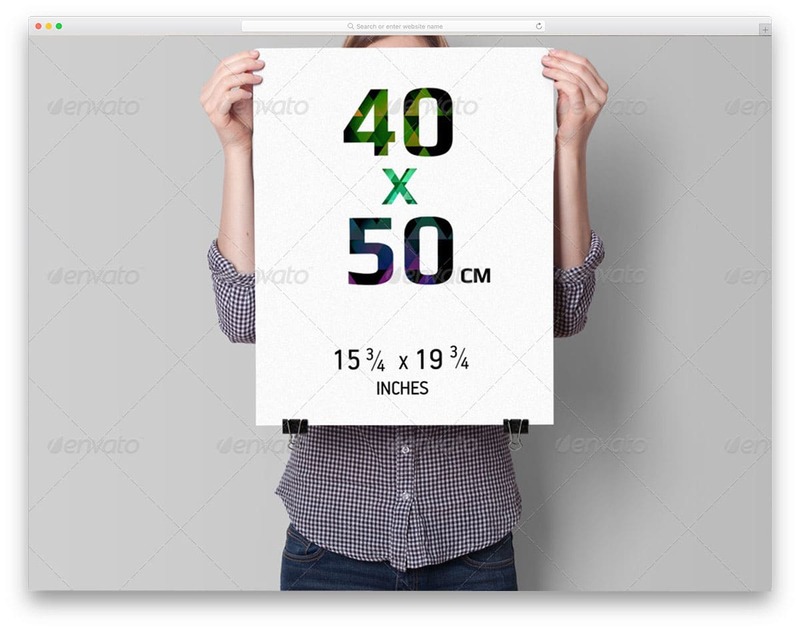 If you are about to make posters of different sizes, this is the mockup to scale your designs easily. The designer of this mockup has included all the major sizes from big to small. All you have to do is to pick the right size and add to the poster frame you like. In the mockup demo, you can see typography designs. But, you can add any type of poster designs to this mockup and it can handle it easily. The poster frames have both thick borders and thin borders. Based on your design you can go for the one you like. With this package, you get eight styles of frames are given in dark and light version. 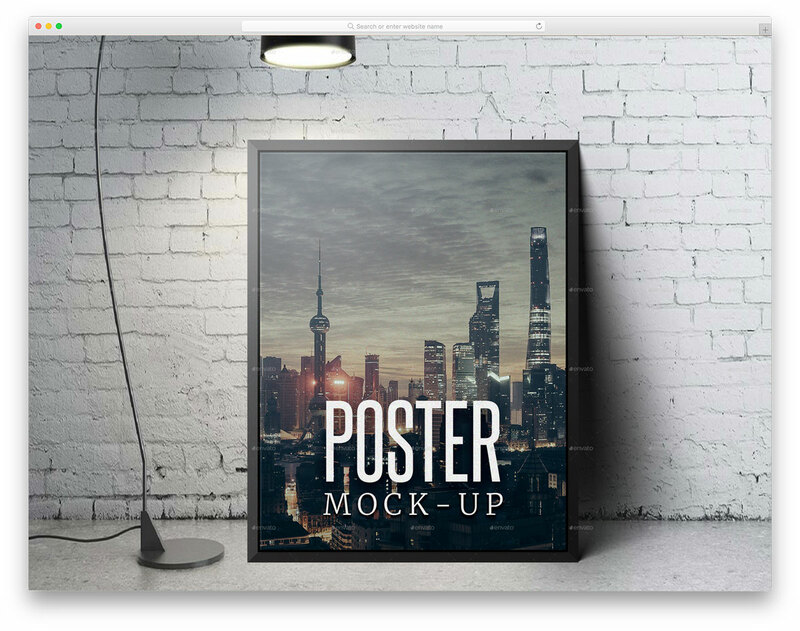 Overall this poster frame mockup gives you more options for a cheaper price. 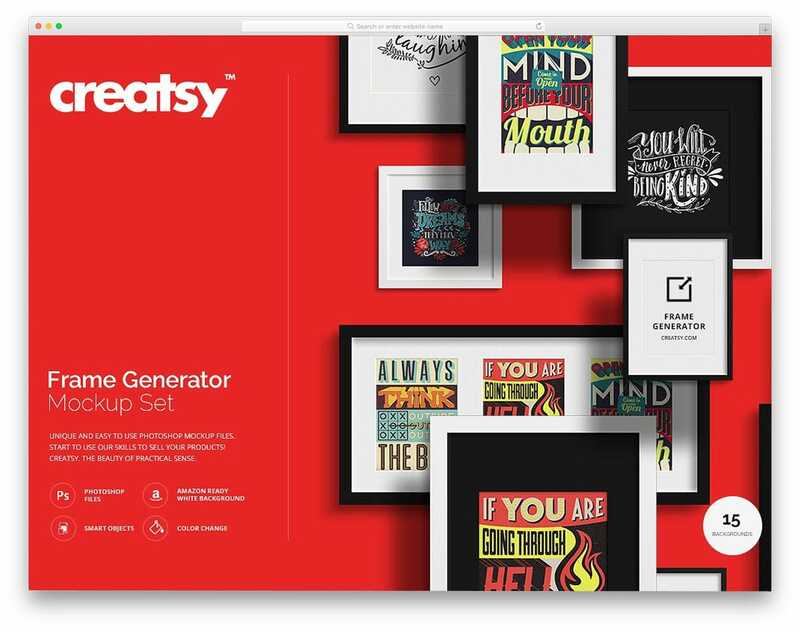 Frame Generator Mockup Set helps you to present your poster designs elegantly to the users. Since this mockup is created especially for frames, you get multiple frame types in this set. 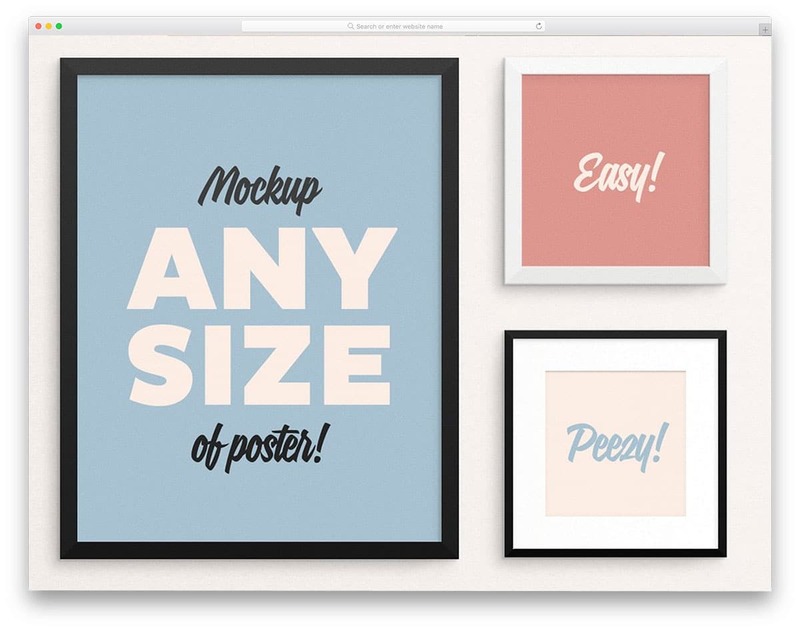 No matter what size your poster size is, there is a frame for you in this mockup set. All you have to do is to pick the frame you like and start editing it to fit your design. The PSD layers are handled smartly so that you can easily find the element you want and can edit it in no time. 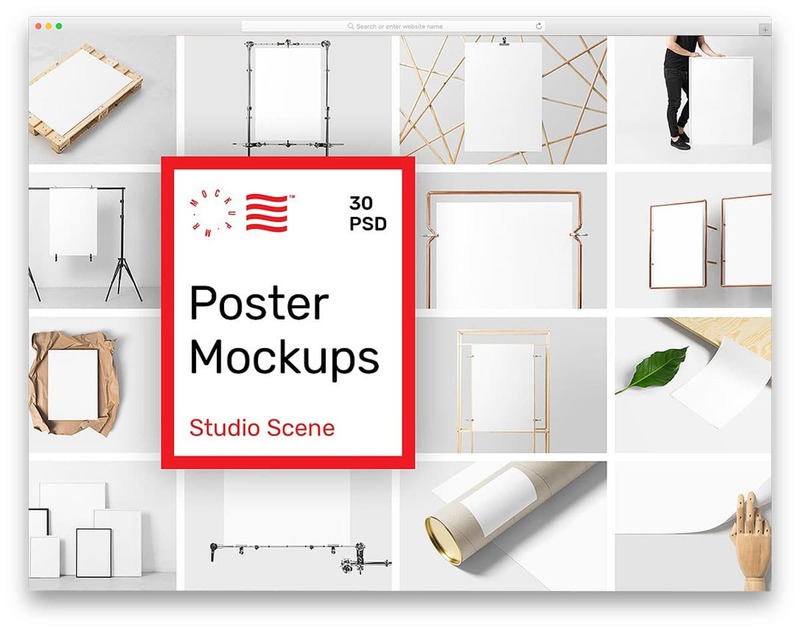 All the eight PSD mockup files have high-resolution images, hence you can easily create high-quality images for your poster presentation. 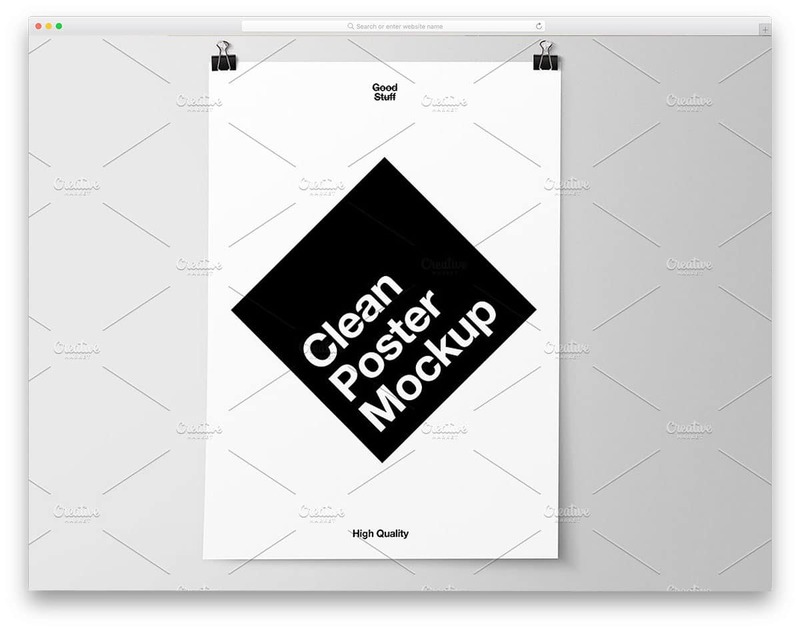 Poster Mockup By Good Stuff is a simple and elegant looking poster mockup. This mockup doesn’t include any fancy stuffs or elements in this mockup. With this mockup, you get a simple hanging poster with clips. The background of the mockup is editable. With the package itself, you get four background options. If you have special needs, you can even add your own custom background. The layers are properly arranged so you won’t find hanging edges. Shadows are also utilized properly in this mockup to give a realistic look to your image. All you have to do is to add your design to the mockup and present it in your portfolio or project presentation. 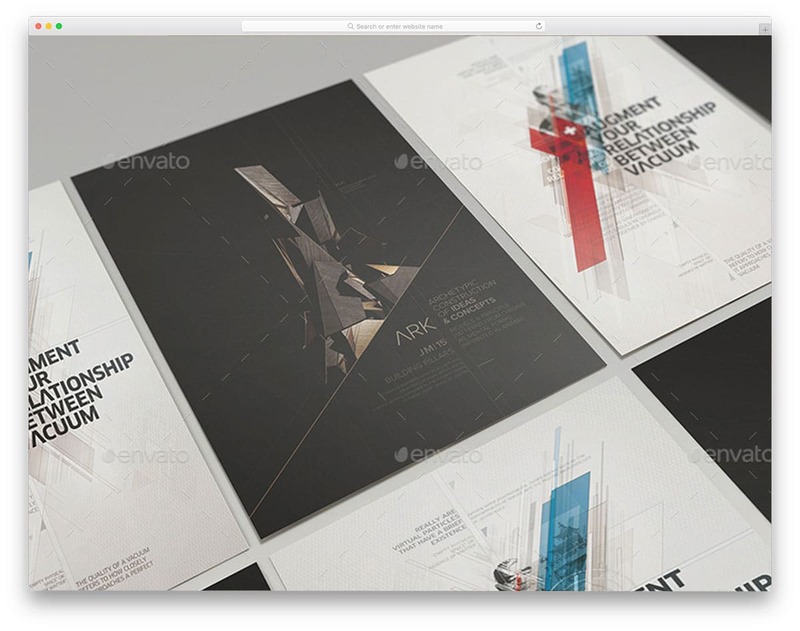 Poster Mockups by Wutip is a unique poster mockup. In most of the mockup, you have a separate sheet. But in this mockup, you get a very detailed design. 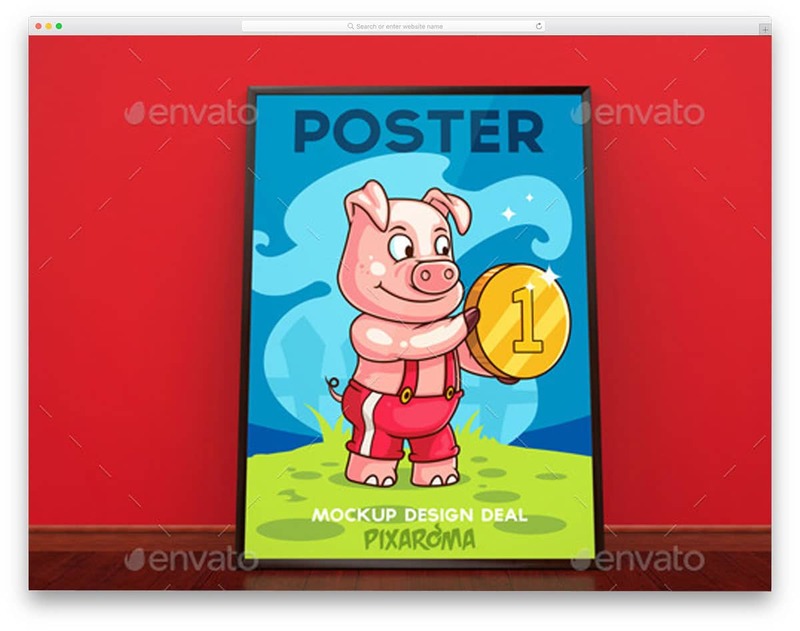 With this mockup, you can show every nook and corner of your poster design neatly to the users. Since it is a three-dimensional based mockup you have the option to show the design in different angles. 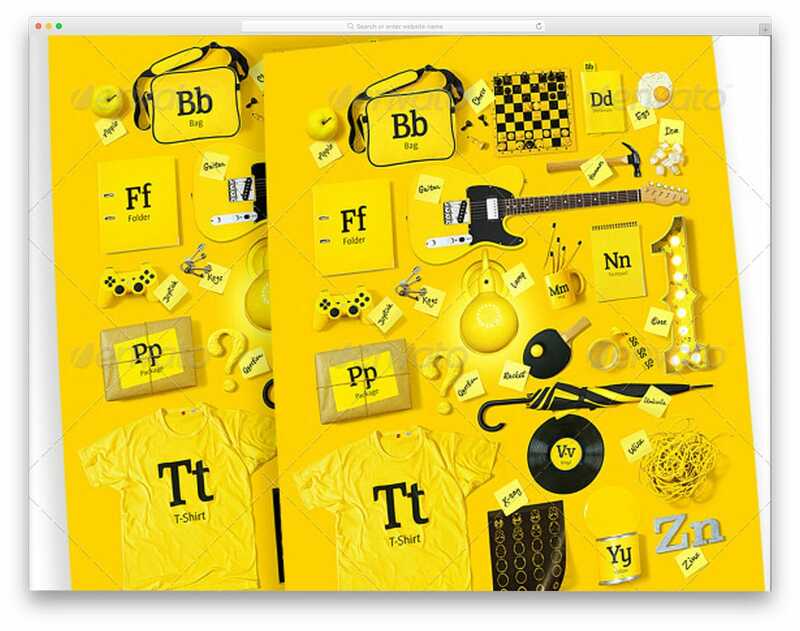 With this package, you get ten pre-made PSD files with different backgrounds. You get sperate layers for the shadows and the textures. So you can showcase any type of design in this mockup without any worries. Modern ad banners have made the creative banners possible and also give life to the posters. Though digital ad banners are increasing, still there are spaces for conventional posters. In metro cities, you can find stands for banners and posters. If you are looking for such banner space for your poster design, then this is the mockup for you. With this mockup, you get only one PSD file with one scene; this might be a small bummer for some users. Because you get more screens and options for the same pricing. But still, if your requirements are less and you need a scene like this, this is the best mockup. You can expect the same design quality like other premium poster mockups in this list. Poster mockup by Design breathe gives you a nice scene with this mockup. The designer of this mockup gives you six background options with different elements. In all the backgrounds the poster mockup is handled properly so that you get a realistic view. You not only get a realistic view with this mockup but also your design is neatly highlighted. Light elements are also given in this mockup and the best part is the shadow and the reflections are kept natural. Most common users can’t any difference when you use this mockup. In the download file, you get 6 PSD files and all of them are properly organized. The creator of the mockup also given you the texture customization option. 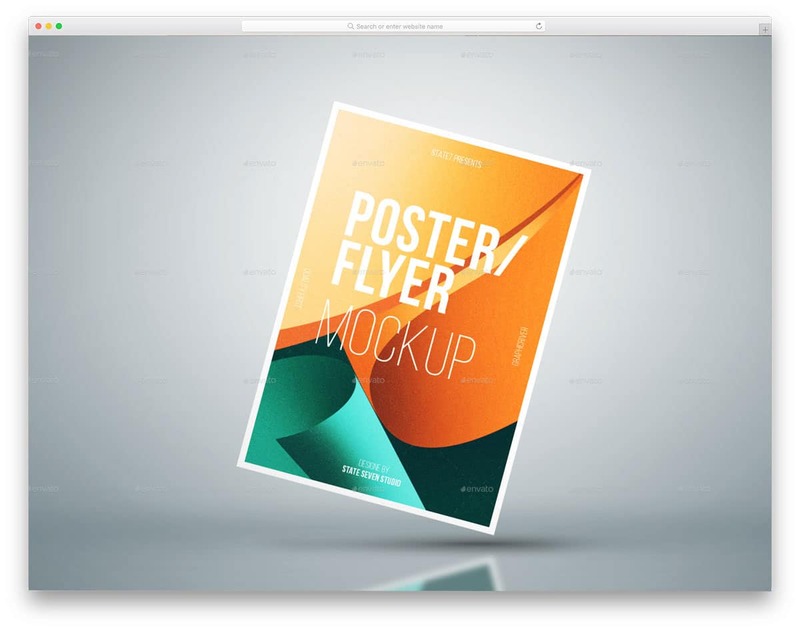 A4 poster mockup is a multipurpose mockup kit for flyers and posters. With this mockup, you get a poster mockup on a reflective surface. The designer of this mockup has taken special care for the reflective surface. Based on the design you add to the mockup, the image on the reflection can also be changed. With this package, you get four PSD files and all of them are easy to edit. The creator of this mockup gives you full freedom to customize the background and other effects given in this mockup. 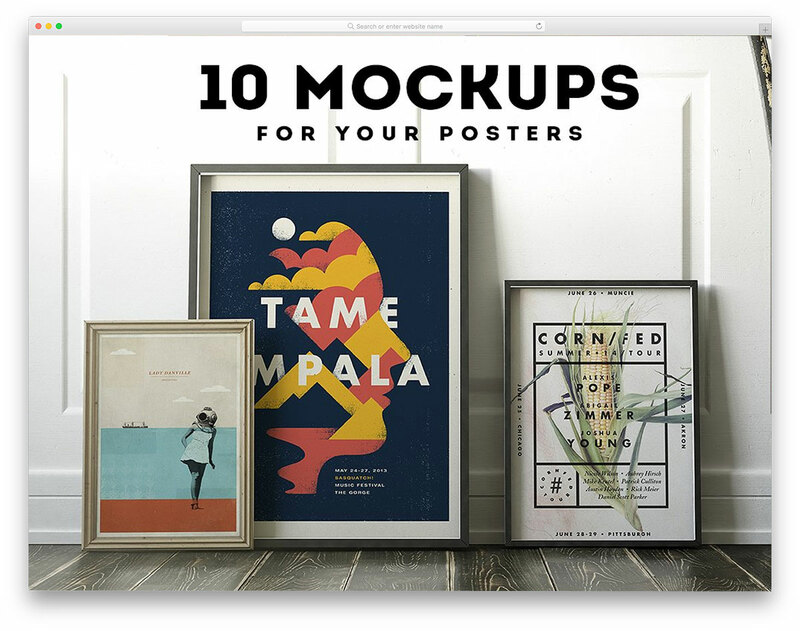 Poster Mockup by Blue Monkey is a mockup that you would normally expect. The designer also made sure that their mockup ticks all the expectation boxes of the customer. In this mockup, you can elegantly highlight your design. Different types of clips and poster hangers are also given as elements, which you can switch easily. The layers are organized properly so that you can easily switch between different background and integrate elements easily. With this package, you get two different angle images and two backgrounds. Other features which you might find useful is the three clip elements and two folded papers. Posters Mockup by MaksN has a bigger poster holder. With this package, you get only one theme, posters are placed on the wall with lights. The edges of the poster holder have shiny steel material. Reflections on the steel edges are preserved neatly, so you get a realistic look. If you are making posters for music concerts or other such entertainment-related event work, this default mockup design will help you. 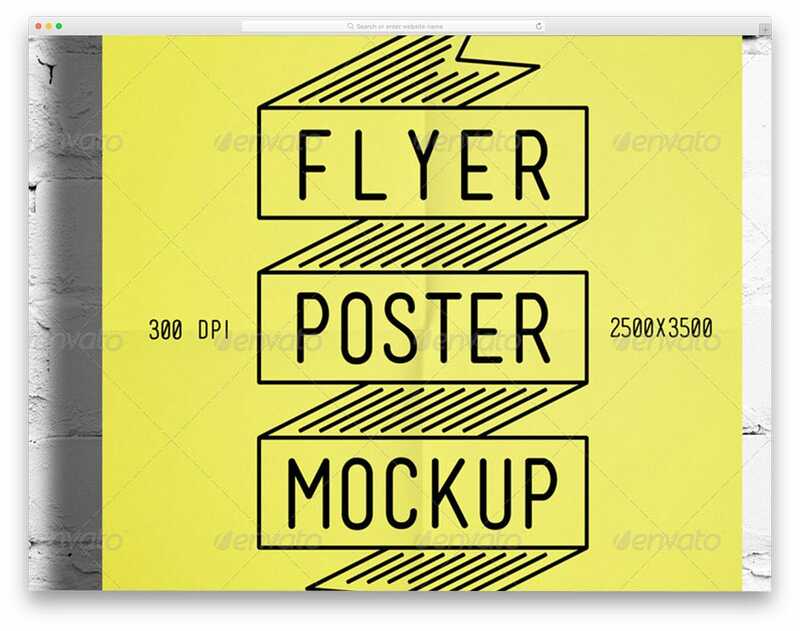 Poster mockups have high-quality images, hence you can zoom in and show your poster design clearly to the users. With this dark theme poster mockup, you can clearly show all types of poster designs. This poster mockup can be used for all types of poster designs. You can show product poster, movie posters, information related posters, and all other types of posters with this mockup. The designer of this mockup has given you unlimited editing options. Based on your design you can change the background image, scenes, and the poster frame. By default, you get a regular sized poster frame, but you can adjust it based on your requirements. Other editable elements on this mockup are the floor and the reflections. Two types of floor options and reflections are given in this mockup. As the name implies, this mockup has art gallery scene. If you are making more than one poster design for a product or organization, mockup like this will come in handy for you. Multiple poster designs can be shown simultaneously. 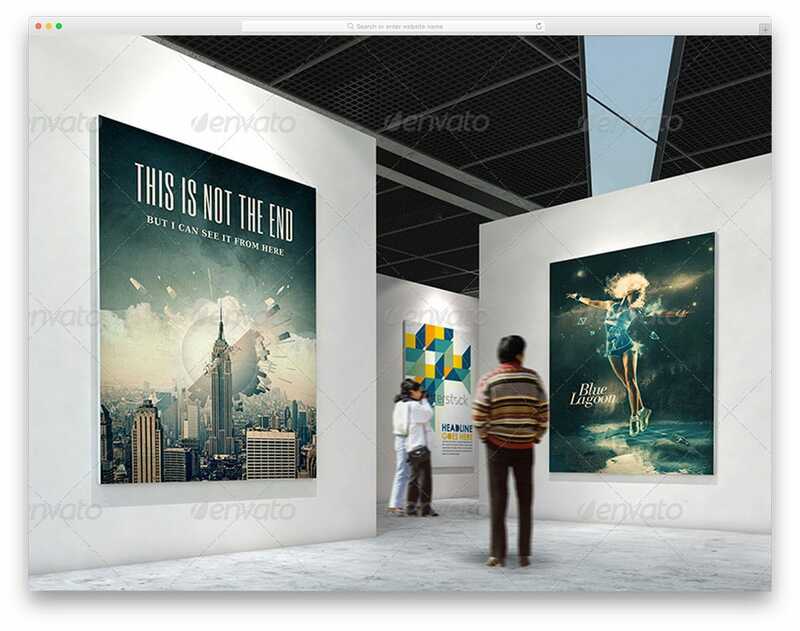 This virtual art gallery scene gives the user a clear idea of all your design variations. In the package, you get mockups with and without humans. Based on your taste you can choose the scene you need. 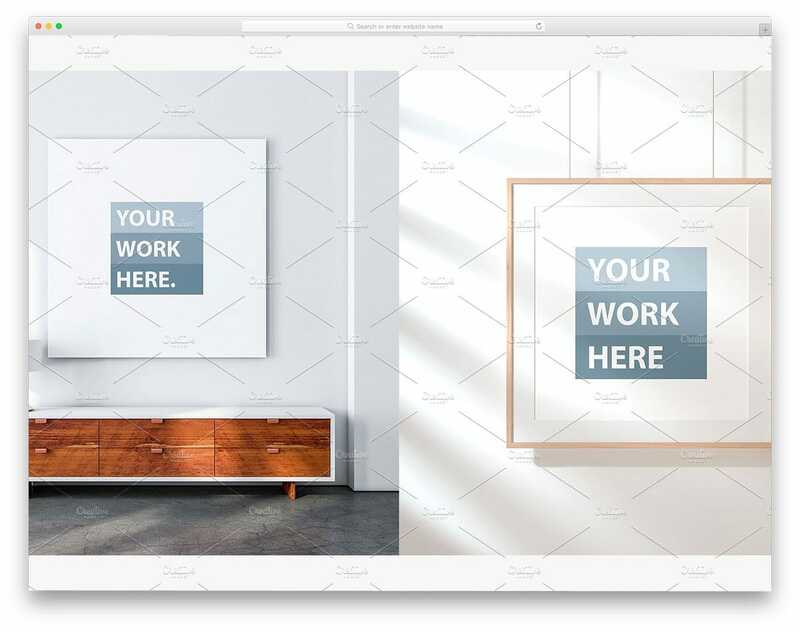 Just like in the above mockup, this one also has lightings on the wall to highlight your design, In the download file, you get ten PSD files and all of them are easy to edit. You might have seen some of the eCommerce website products compare product size with human height. By giving comparing options, users will get a clear idea about the size of the product. If you are making poster designs in different sizes, this is the perfect mockup for you. In the mockup, you have a woman holding the poster frame. All the regular poster sizes and orientations are given in this mockup. Since the posters are held by a human, the audience can clearly get an idea of the size and the look of the design. If you are planning to present your poster design in more than one angle, this mockup will help you. The seven variations in this mockup have both isolated poster image and multiple poster images. With this mockup, you can clearly showcase your designs and also compare all your variations in one image. 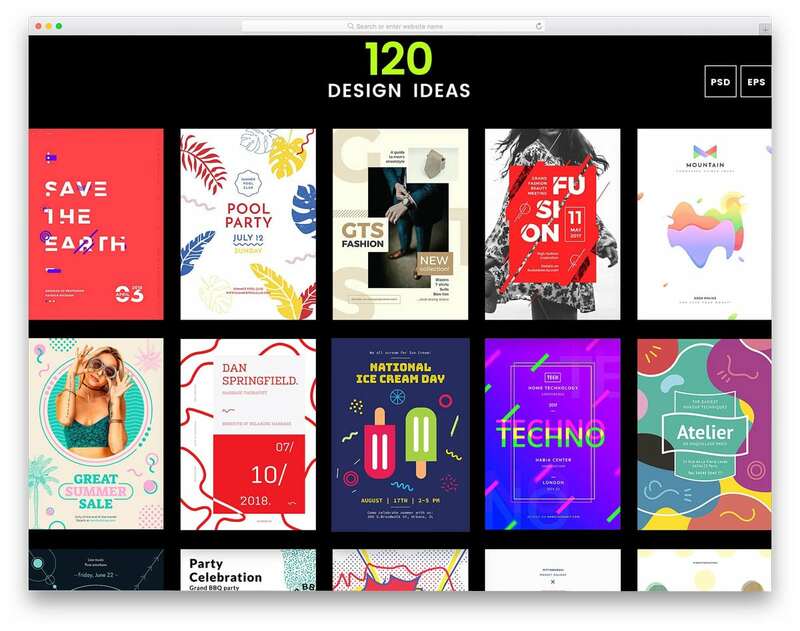 For example, if you have two poster variations, you can show the designs side by side for better understanding For optimal results, the designer of this mockup recommends Photoshop version CS4 and above.